Listen to an audio recording of the March 5 conversation (conducted in English) between Berkley Center Senior Fellow Rev. David Hollenbach, S.J., and Gaël Giraud, S.J., on addressing growing global displacement of people through a renewed commitment to the transnational common good. It was hosted by the Sèvres Centre, a Jesuit institution in Paris. He works on human rights and humanitarian issues, largely in Africa, teaching regularly at Hekima University College in Nairobi, Kenya. He has also taught at the Jesuit Philosophy Institute in Ho Chi Minh City, Vietnam, and at the East Asian Pastoral Institute in Manila, Philippines. Hollenbach collaborates with the Jesuit Refugee Service on the human rights of displaced persons. He has conducted workshops for parliamentarians and for church leaders in South Sudan on human rights in their newly independent country. Rev. Hollenbach is the author of numerous works, his best known being The Common Good and Christian Ethics (Cambridge University Press, 2002). His other books include Driven from Home: Protecting the Rights of Forced Migrants (Georgetown University Press, 2010), The Global Face of Public Faith: Politics, Human Rights, and Christian Ethics (Georgetown University Press, 2003), and Refugee Rights: Ethics Advocacy, and Africa (Georgetown University Press, 2008, as editor). His new book, Humanity in Crisis: Ethical and Religious Responses to Refugees, will be published in the summer of 2019 by Georgetown University Press. 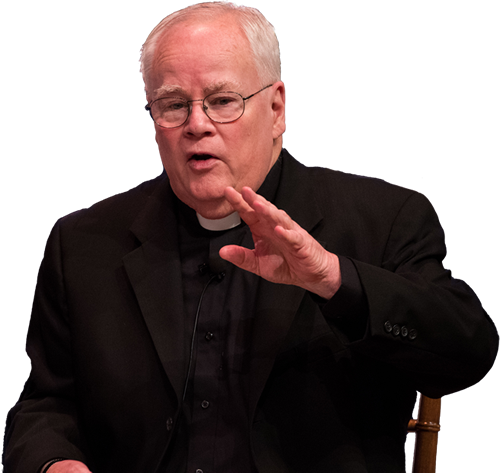 He is the past president of the Catholic Theological Society of America and the Society of Christian Ethics. He assisted the United States Conference of Catholic Bishops in drafting their 1986 pastoral letter Economic Justice for All: Catholic Social Teaching and the U.S. Economy. His awards include the Civitas Dei Medal from Villanova University and the Marianist Award from the University of Dayton for Catholic contributions to intellectual life. He received the John Courtney Murray Award for outstanding contributions to theology from the Catholic Theological Society of America, as well as a number of honorary degrees. Rev. Hollenbach obtained his Ph.D. from Yale University and his B.S. from St. Joseph’s University; he also earned his M.A. and Ph.L. degrees from St. Louis University. He entered the Society of Jesus in 1964 and was ordained a priest in 1971.